Dave Rempis has had many projects. This is one of the great ones. Close your eyes and imagine a new jazz trio with a saxophonist, a bassist and a percussionist. You probably have a certain sound in mind already, right? Now, throw out the idea of the traditional chart. Give the bassist his bow, a guimbri and a small harp and give the saxophonist a baritone in addition to his alto. And finally, turn that drummer into the great Avreeayl Ra. Not sure what to think now? Well, that's where the fun begins. 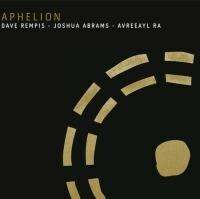 You, lucky listener, get to experience Aphelion for the first time in all its organic majesty. The three compositions on this album were recorded maybe just one year after Dave Rempis joined forces with Joshua Abrams and Ra, but it's scary how atmospheric they become. One moment it's Eno fog, the next it's blistering, stratospheric bop. Aphelion doesn't inspire admiration, it inspires wonder. Bring it home today and confound, I mean, convert the neighbors.